GopherCentral Library: Phunny Pictures - I was really fried last night! Phunny Pictures - I was really fried last night! Its Fall now, and Winter is coming up soon enough, so I bought myself a new jacket. I really needed it. MY old jacket was in bad shape. My old jacket was full a holes, it smelled and the zipper was brokin. I was at the store and when I saw this jacket I new it was for me. It looked good, it fit me verry well, and it was priced right. So, why not? I wore the jacket home after i purchased it and when I pulled up in the driveway i saw my wife out in the yard waitin for me. I walked up to her lookin really cool and said, "Hey, you're lookin' good." Then she said, "What's that you're wearin' there?" Then I responded, ""It's my new jacket. You like?" "Yeah. Why did you get that?" she asked. 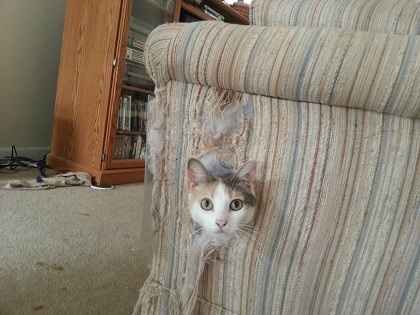 "Well, My old jacket was full a holes, it smelled and the zipper was brokin," I explained. Then she said, "Oh, if that was the case, why didn't you get yourself any new pants?" Sorry Rover. The McDonald's mascot has already been chosen! No, I haven't seen your fries. 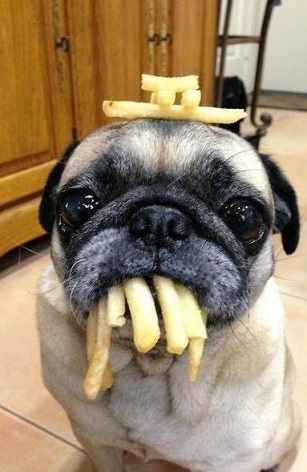 The pug will lug fries mainly on the rug. I don't know where he gets them, but hey - free fries! I was really fried last night! French fries? What French fries? That's nothing, you should see what he does with onion rings. Help, my owner is a TATER freak! Excuse me. Can you direct me to the ketchup, please?